Born on September 21, 1926 in Lawrence, MA, he was the son of George and Joan Kunhardt. He was predeceased by Margaret Hale Kunhardt in 2004, and is survived by Mary Lou Lavallee, his children Elizabeth, Daniel, Susan and Amelia, seven grandchildren, and five great-grandchildren. 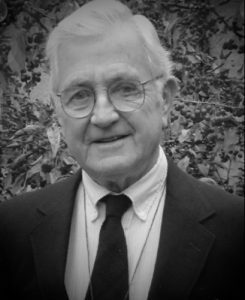 He attended Bowdoin College, then General, and was ordained an Episcopal priest in 1952. From 1955 to 1958 he served as a Chaplain in the Air Force Reserve, stationed in Roswell, NM and Fairbanks, AK. He served as rector of Episcopal churches in Tacoma, WA, and Wilbraham, MA, and on the staff at Christ Church Cathedral in Springfield, MA. In 1975 he transitioned out of parish work to follow his calling as a pastoral counselor in the field of alcoholism treatment, serving patients at the Springfield, MA city detox and at Beech Hill Hospital in Dublin, NH. He retired to Bath, ME in 1991 and moved to Brunswick in 2005. A Celebration of Life was held on Wednesday, August 16 at 1:00 p.m. at Grace Episcopal Church, Bath, ME. Burial was at Meetinghouse Cemetery in Marlborough, NH.